The other day the kerfed magnetic weather stripping on the latch side of my front steel front entry door split and I decided to replace it. I know better than uninstalling something without having a replacement, but I took down the stripping first and headed to the local hardware store to pick up a replacement. The local store is not a big box, but usually carries 80% of what I need. In this case, they didn't have the replacement that I wanted. The only had kerfed compression seals and not the magnetic ones. I went to both HD and Lowes and neither had them in stock. Strange, but they checked into them at Lowes and they have them up north of Oklahoma, but none in the Southern US. Weird, but ok. I ordered a magnetic weatherstrip for kerfed doors and it arrived this week. I installed it and, as can only be expected, there's a ton of light coming thru the door around the top latch side of the door. I did the string test on the door and it doesn't look warped at all. I used a level and square on the jamb and stop and they look fine. I'm wondering about the solution to making the seal tight? Attached is a photo. Any advice on adjusting the door or stop would be much appreciated. 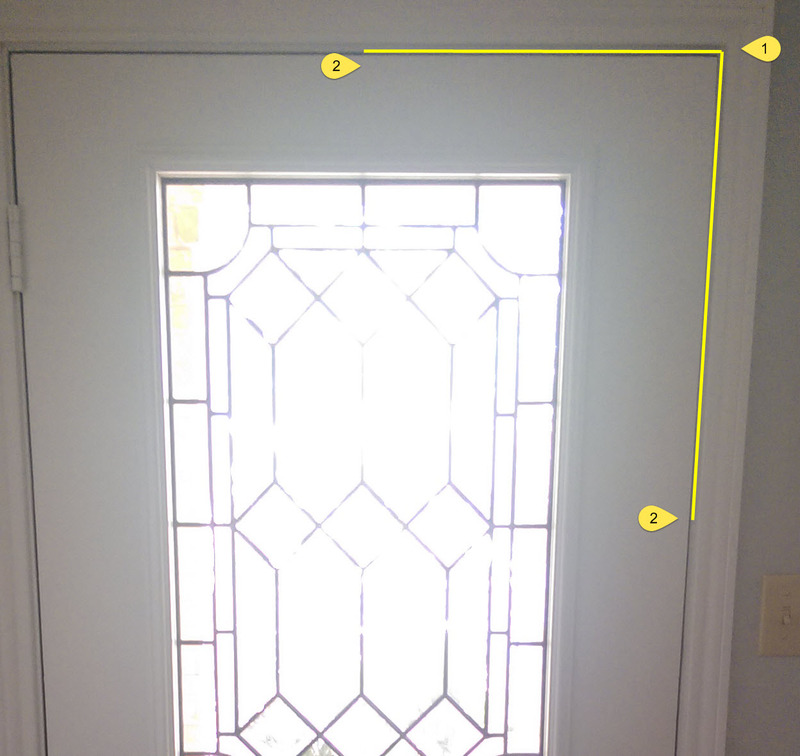 The yellow line shows where light can be seen from the inside. The number 1 shows where the largest gap exists and the number 2 shows where the light stops being visible. Last edited by AustinReDevelop; 08-16-2014 at 01:56 PM. Reason: noticed that I wrote jamb and meant stop. Use v-strip in addition to the compression gasket. bottom of the jamb hinge side needs to go in...looks like to me.. If the jamb is set, cased and all purdy .... move the top hinge, jamb leaf, toward the inside of the house or on the door side move the door toward the knuckle of the top hinge. Magnetic weather stripping and to be out that far not to seal- either the stripping didn't lay even in the kerf or the jamb is 1/4"+ out of plain or the door is twisted. If the top needs to go in then you could move the top hinge in closer to the weather strip/door stop. With those doors you might be able to put your foot at the outer knob side at the bottom, then pull on the top knob side of the door. This will tweak everything to how you want it. You need to be careful so you don't break the window though. It is a risky maneuver. Or you could tuck some smaller weather strip behind the existing weather strip right at the top. Of course it will need to be the stuff with a sticky backing. Can't you put a level on the door and the door jamb or casing or wall and tell us what is going on? I'd hate to start beating on the jamb if you didn't get your weatherstrip in right. -try tweaking the door as mentioned above. -adjust lock latch plate so that door closes tighter. -remove trim and sawzall cut nails on side, and try shifting frame a bit and renail. sledge and block may help. -on the frame where the seal presses in, scribe and cut it on lower edge of door, so that the seal is further out. Sorry for the delay in replying to this, but two weeks ago, I fixed the door. I was looking at the lock latch plate and remembered that my wife wanted to show me how handy she was one weekend and had swapped out the door hardware. I recall that the door handle was not plumb, but after a little ribbing, I let it go. 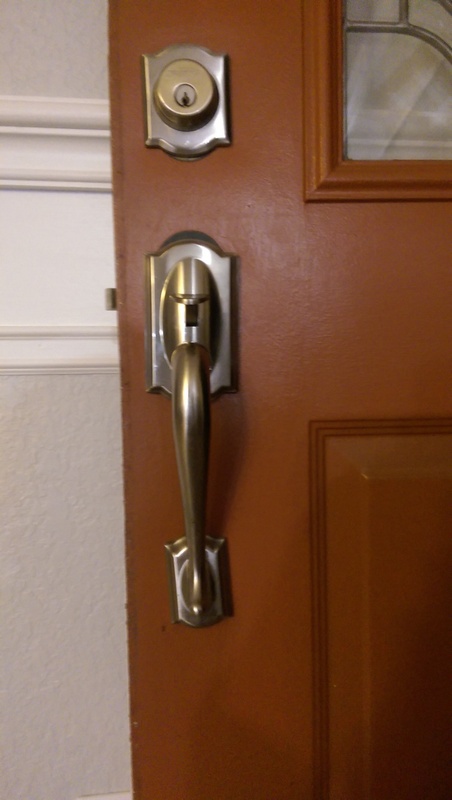 I should have checked the rest of the install, but I guess I was having too much fun with the crooked handle. So all this and upon checking the lock latch plate, it was clearly positioned too close to the interior edge of the jamb. Re-positioned the latch plate and the door closes and seals. Ugh. I guess that's what I get for poking fun.